For young children, a lift-the-page look at what makes Easter special. 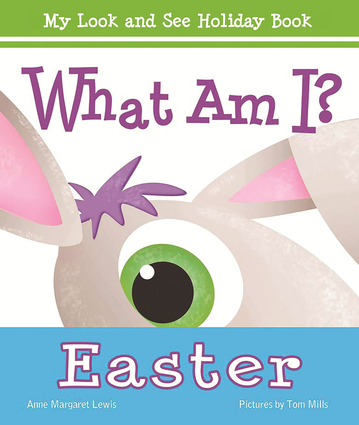 From Spring flowers to the Easter parade, this is a sure hit for little ones as they guess "What Am I?" and lift the page to find out! Anne Margaret Lewis is an award-winning and bestselling author of more than ten children's books. She enjoys working with fun fictional characters and carefully weaving important lessons into her stories. A graduate of the University of Michigan, she lives with her husband and four children in northern Michigan.Tom Mills has over twenty-five years background in art direction, graphic design, and marketing and branding. An award-winning cartoon animator and illustrator, Tom has taught college classes in graphic design and creative thinking, and has been teaching cartoon animation to children for more than fifteen years. He lives in Traverse City, Michigan with his wife.